RC Testing's decontamination practices follow industry standards. Microbiological contamination is eradicated using the ClorDiSys System and all decontamination processes are formulated and planned to protect staff and personnel. RC Testing has carried out decontamination projects over the entire northeast of the USA for over 25 years with a proven track record of safety and success. The main advantage of the ClorDiSys system is that the process is much faster than older technologies. Whole room decontamination using the Halosil disinfection system. 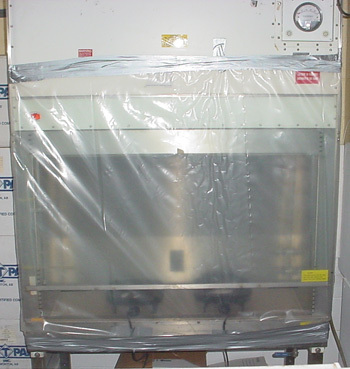 RC Testing will decontaminate, relocate and re-certify your equipment.